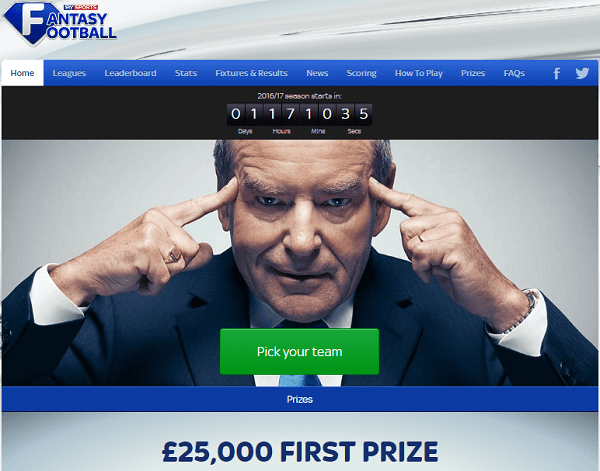 Sky Sports Fantasy Football is one of the most exciting ways of enjoying the football season. The absolutely free to play game is available on Google Play and App store and promises a spectacular season for all of us. There are thousands of prizes to be won and a variety of fantastic features to be enjoyed. The site has live points updates and free set up private leagues and an opportunity to face off head to head with the pundits and presenters of Sky Sports. These features are incomparable to no other. You will have an assistant manager who has been scouting through the summer break and returns to guide you through the season. The role of the assistant is to advise you on transfers, various changes and give you regular updates about the condition of the players. The shortlist feature allows you to monitor a number of players of interest and make a decision on whom to buy depending on their progress reports. There are more ways of getting rewards as the season progresses through various Awards. These will offer a consistent challenge; reward your efforts and the opportunity to showcase your brilliance as a football manager. The sky sports fantasy football is even better this time round. The prizes are bigger and better. If the premier continues to be as brutal and competitive as it has always been, sky sports fantasy football league promises the most exciting way of enjoying the game. A number of the world’s best footballers are in the league and the game is giving you the chance of taking advantage of the stars by allowing you to choose three free teams. The site will provide previews, reviews, reports and analysis on fantasy football throughout the season. You will not miss any news on the football arena and it will be up to you to choose the best team. All this is absolutely free, tell friends to tell a friend and make the game fun while playing against each other even for bragging rights. The transfer window is open and here is your chance of making a permanent mark on this amazing game. Nowadays, there is no Barclays Premier league without sky sports fantasy football. If you are only watching the league and forgetting fantasy football, then you are missing out on a very fundamental part of the game. The sky sports fantasy football league has helped the fans to participate fully in the league and experience what the actual managers do. Well you can criticize the coaches anymore if your team is not doing any better in the fantasy league. This is the time to put your football knowledge into practice and select your winning 14 players and compete with others for whatever prize. 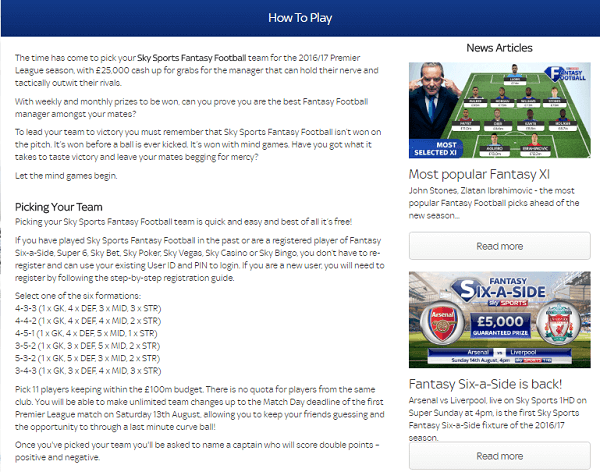 How to Play Sky Sports Fantasy Football League? The Sky Sports Fantasy Football league is very easy to join and start playing. First, you need to access sky sports fantasy football and download the application or play download free through your browser. The application is available on Google Play or App Store so you will certainly find a suitable one. The direct play is not as efficient as the application since it can have delays depending on the network and incur extra costs each time you access it. This is followed by signing up where you create your sky sports account by filling some identification details. Financial details are not necessary since the game is absolutely free. Once your account is ready, you select your team of 14 players though you will be able to make transfers regularly to refresh your squad. You can create up to three teams and this feature helps you utilize a number of top players in the league. The fantasy football scout is available in the site to provide you with information about the players and the teams. The site has previews, reviews and analysis about the players and this will guide your selection. An assistant manager will also be provided to give you suggestions about the squad and the transfers you should consider. In addition, there is the shortlist feature which enables you to highlight on a number of players before making a decision on whether to buy them or not. These are all geared to helping you realize your maximum potential as a football manager. All the choices you make should be informed since a mistake could take you to the bottom of the table and the uphill climb will be quite hectic. Sky Sports Fantasy football allows transfers till a particular deadline on a particular game week and this is usually the game day. It is very important to check your team regularly to ensure that you have not selected an injured player. Each week should be a recruitment week for you to check your teams and make the necessary changes needed to keep you in a winning form. 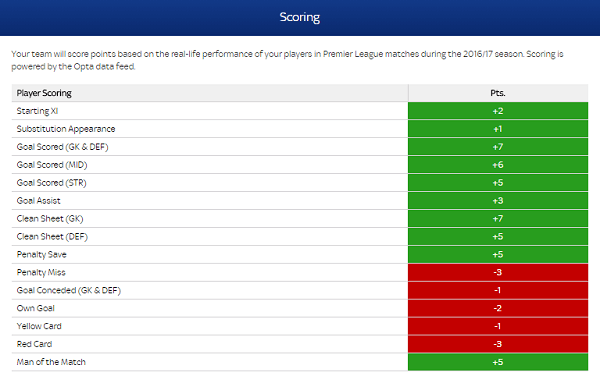 The ICT index is used to assess players in the sky sports fantasy football league. It utilizes statistical data to generate a score for each player by considering three core factors: influence, creativity and threat. This is a measure how important a player is to the team and the overall contribution he makes to the progress of the team. Sky Sports fantasy football comes up with a score for each player on a weekly basis depending on how the player played the previous match. You can access the points a player has been getting and the cumulative points earned and this will help you in your transfers and team selections. There is no bias allowed in the award of points; the players are all awarded according to their importance to the team. The sky sports fantasy football league is one of the most brilliant ideas ever developed in the world of football. It has created a connection between the fans and the players and the league is much more appreciated.